This integration enables our engineering team to build computer models for numerous designs. To reduce time-to-production and improve quality, we simulate and optimize the design before initial physical prototypes are built. AES can be your virtual resource for rapid new product development. Our experience with state-of-the-art computer-aided engineering tools and our technical expertise can help you accelerate the achievement of your strategic business goals. We use software tools that utilize the Theory of Inventive Problem Solving to evaluate and improve your conceptual designs. We use Topological Optimization Technology to create the optimum shape of components based on load paths. We utilize engineering selection methodology that enables quantitative optimal selection of materials, processes, components or other engineering entities from relational databases. We have experience with feature-based solid modeling of complex geometry, as well as automatic finite element mesh generation of solid and thin wall models. Structural Static and Dynamic Analysis. We are skilled in stress analysis, including buckling, material and geometric non-linearities, and metal forming simulation. We are expert in analyzing transient dynamics, harmonic response, random vibration, response spectrums, fatigue and fracture. Rigid and Flexible Body Mechanical Dynamics. We are proficient with mechanism system analysis (kinematics and kinetics) and collision and lock-up configuration detection, including rigid and flexible components. We use the state-of-the-art Explicit Dynamics finite element codes to evaluate the crashworthiness of road vehicles, aircraft, ships, and trains. 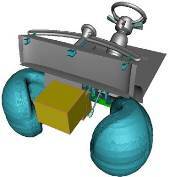 Sophisticated crash simulation with airbags, seatbelts, and dummies improves automobile design and safety. Simulating drop tests of consumer electronic products, packaging materials, power tools, etc. leads to fast design evaluation and to more robust and durable products. Probabilistic analysis for safety, reliability, and risk assessments. We are experienced with analyzing coupled field problems such as thermal-structural, fluid-structural, electromagnetic, and electro-thermal. We have experience with assessing laminar and turbulent flow; incompressible or compressible fluids; forced, free, and mixed convection; conjugate heat transfer; and distributed flow resistance. Air, rail and ship transportability analyses (MIL-STD-1791) of vehicles. Experience with military aircrafts such as MV-22, CH-53, C-130 etc. External Air Transport Analyses, Load Master and Engineering Method tie-down analyses for shipment via military aircrafts (MIL-STD-209K). Mobility analyses of military vehicles for various performance specifications (RMS courses, half rounds, durability profiles, etc). NMRM and 3D Multibody dynamic analyses are performed.